This is a Uniblock Machine were all the three sections are on the same Platform. The main platform structure will be of M. S. suitably clayed Stainless Steel. The machine is attached with an in feed Air Blow Tunnel, Which is also fitted with an Air Blower on top of the Tunnel along with a Flow Regulating Valve for regulating the Air pressure. The Suction of the Air Blower is fitted with an Air Filter. This Tunnel helps the bottle to travel to the Rinsing In feed Neck guide plate with the help of Neck Guide and Air Pressure. The gripping fingers will hold the bottle by neck and necessary guide bars will invert the bottle upside down by 180 degree. The duty inverted bottle will receive water from the rinsing nozzles on rear of the machine. 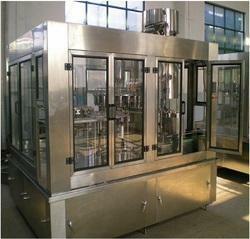 The rinsing will operate from 90 to 270 degree rotation of the rinsing machine. Zero degree position is in front of the operator. We have complete allegiance in offering modern day Juice Plant. 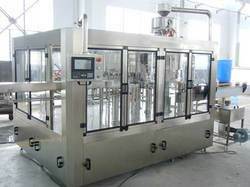 The bottling line is designed for efficient performance in filling, sealing and labeling pet bottles that are used for juice. The filling system is widely accepted in the industry for its assured no spillage performance, further, the magnetic capping heads ensure reliable sealing of the bottles. Besides, our esteemed patrons can avail the plants from us at a leading price. 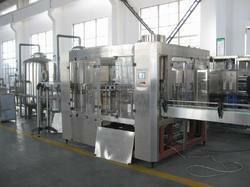 We have gathered huge recognizance by developing highly demanded Juice Filling Plant. The radically mounted rotors in this machine ensure high speed operation at a smaller footprint. Innovatively designed to minimize human involvement the offered machine is demanded widely for its intelligent performance in filling precise levels of juice and stop alarms when running out of liquid. 200 ml – 2 Ltr.